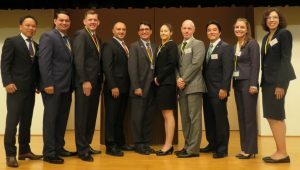 The twenty-third class of Mike Mansfield Fellows participated in a week of orientation activities in Tokyo, prior to beginning their placements within the Japanese government next Monday. On Monday, August 27, the nine participants met with representatives of the National Personnel Authority (NPA) and the host agencies for their first placements. On Tuesday, the Fellows received a briefing at the U.S. Embassy and met with Mansfield Vice President Benjamin Self and Associate Director of Programs Stephanie Sanders. 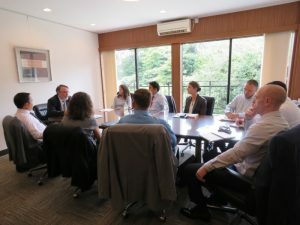 The group discussed the U.S.-Japan relationship, how to make the most of their ten months of placements with Japanese agencies, and the benefits of working with Diet members. Yesterday, the Fellows were welcomed at a reception at the Ministry of Foreign Affairs, hosted by the Mansfield Foundation, MOFA, and the NPA. About 200 guests attended, representing host agencies, the Japanese Diet, U.S. Embassy Tokyo, and other well-wishers. Each Fellow gave short aisatsu remarks in Japanese, greeting the guests and partner organizations. 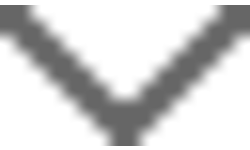 This entry was posted in Fellowship Experiences and tagged Mansfield Foundation Tokyo office, MFP No. 23, Ministry of Foreign Affairs, MOFA, National Diet, National Personnel Authority (NPA), U.S. Embassy Tokyo. Bookmark the permalink.